Newport Beach, CA — According to board certified plastic surgeon Dr. Semira Bayati, the rules of skin care have changed. While she typically dedicates her time to performing a variety of cosmetic procedures ranging from the facelift to BOTOX® injections, Dr. Bayati says the quality and tone of one’s skin has a significant impact on their overall aesthetic appearance, therefore it is extremely important to maintain proper skin health. In an effort to help her patients navigate through the amount of information concerning skin health, she recently discussed commonly accepted skin care rules, and why they may be falling out of fashion. At her Newport Beach plastic surgery practice, Dr. Bayati says a majority of her patients desire the head-to-toe glow that not only exudes beauty, but confidence as well. Healthy and radiant skin is one way to achieve that glow, but she admits the path to healthy skin can often be frustrating with the amount of misinformation patients receive from family and friends, television commercials, and the internet. One long-standing rule that Dr. Bayati says has come under fire recently is the need to wash one’s face twice daily. While the need to wash the face depends on whether women wear makeup daily or live in a heavily polluted area, she says washing too much can rid the face of important, naturally-hydrating oils, leaving the skin dry and vulnerable to bacteria. 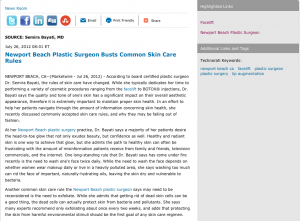 Another common skin care rule the Newport Beach plastic surgeon says may need to be reconsidered is the need to exfoliate. While she admits that getting rid of dead skin cells can be a good thing, the dead cells can actually protect skin from bacteria and pollutants. She says many experts recommend only exfoliating about once every two weeks, and adds that protecting the skin from harmful environmental stimuli should be the first goal of any skin care regimen. Whether Dr. Bayati is helping patients address skin care concerns with chemical peels or microdermabrasion, or more complex aesthetic issues with a procedure such as lip augmentation, she says she constantly strives to improve her patients’ confidence and comfort in their own skin. She adds that when considering various skin care methods and trying to determine the best approach to preserving the vibrancy of their skin, she urges patients to consult with an experienced and skilled skin care professional, while basing their decisions on scientific fact instead of commonly accepted rules. Dr. Semira Bayati earned her medical degree from the Boston University School of Medicine. She then completed a general surgery and plastic surgery residency at the Southern Illinois University School of Medicine, as well as a Fellowship at Loma Linda University Medical Center. She is certified by the American Board of Plastic Surgery, is a Fellow of the American College of Surgeons, and a member of the American Society for Aesthetic Plastic Surgery and the American Society of Plastic Surgeons. Dr. Bayati’s practice is located at 20311 SW Birch St., Ste. 200, Newport Beach, CA 92660, and can be reached at (949) 756-0400. She can also be contacted online at drbayati.com or her Newport Beach Plastic Surgery Facebook page.